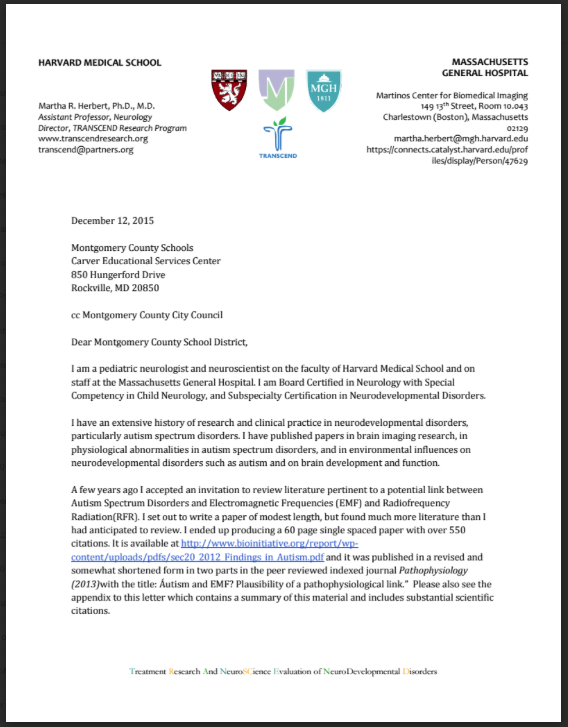 "I urge you to opt for wired technologies in Montgomery County classrooms, particularly for those subpopulations that are most sensitive. It will be easier for you to make a healthier decision now than to undo misguided decisions later." I am a pediatric neurologist and neuroscientist on the faculty of Harvard Medical School and on staff at the Massachusetts General Hospital. I am Board Certified in Neurology with Special Competency in Child Neurology, and Subspecialty Certification in Neurodevelopmental Disorders. I have an extensive history of research and clinical practice in neurodevelopmental disorders, particularly autism spectrum disorders. I have published papers in brain imaging research, in physiological abnormalities in autism spectrum disorders, and in environmental influences on neurodevelopmental disorders such as autism and on brain development and function. A few years ago I accepted an invitation to review literature pertinent to a potential link between Autism Spectrum Disorders and Electromagnetic Frequencies (EMF) and Radiofrequency Radiation(RFR). I set out to write a paper of modest length, but found much more literature than I had anticipated to review. I ended up producing a 60 page single spaced paper with over 550 citations. It is available at http://www.bioinitiative.org/report/wpcontent/uploads/pdfs/sec20_2012_Findings_in_Autism.pdf and it was published in a revised and somewhat shortened form in two parts in the peer reviewed indexed journal Pathophysiology (2013)with the title: Áutism and EMF? Plausibility of a pathophysiological link.” Please also see the appendix to this letter which contains a summary of this material and includes substantial scientific citations. More recently I published an article entitled “Connections in Our Environment: Sizing upElectromagnetic Fields,” in Autism Notebook Spring 2015 edition in which I summarized and personalized the information in the . In this article I describe how here is a whole series of problems at the cellular, sub-cellular and metabolic levels and immune levels that have been identified in autism. And interestingly, for every single one of those problems, there’s literature about how EMFs can create those kinds of problems. In fact, there are thousands of papers that have accumulated over decades –and are now accumulating at an accelerating pace, as our ability to measure impacts become more sensitive – that document adverse health and neurological impacts of EMF/RFR. Children are more vulnerable than adults, and children with chronic illnesses and/or neurodevelopmental disabilities are even more vulnerable. Elderly or chronically ill adults are more vulnerable than healthy adults. Radiofrequency electromagnetic radiation from wifi and cell towers can exert a disorganizing effect on the ability to learn and remember, and can also be destabilizing to immune and metabolic function. This will make it harder for some children to learn, particularly those who are already having learning or medical problems in the first place. And since half of the children in this country have some kind of chronic illness, this means that a lot of people are more vulnerable than you might expect to these issues. I urge you to opt for wired technologies in Montgomery County classrooms, particularly for those subpopulations that are most sensitive. It will be easier for you to make a healthier decision now than to undo misguided decisions later. I became interested in the health and brain effects of electromagnetic frequency (EMF) and radiofrequency radiation (RFR) exposures in relation to my brain research because I was interested in how such exposures might alter brain function. In order to familiarize myself in more detail existing literature on the pathophysiological impacts of EMF/RFR, I coauthored a 40,000 word chapter in the 2012 update of the Bioinitiative, 1 and published an updated 30,000 word version of that paper (“Autism and EMF? Plausibility of a Pathophysiological Link”) in 2013 in two parts in the peer reviewed journal Pathophysiology. 2, 3 My intention was to assess the plausibility of an association between increasing incidence of autism spectrum disorder and increasing EMF/RFR exposures. EMF/RFR damages mitochondria. Mitochondria are the energy factories of our cells. Mitochondria conduct their chemical reactions on their membranes. When those membranes get damaged, the mitochondria struggle to do their work and don’t do it so well. Mitochondria can also be damaged through direct hits to steps in their chemical assembly line. When mitochondria get inefficient, so do we. This can hit our brains especially hard, since electrical communication and synapses in the brain demands huge amounts of energy. EMF/RFR creates “oxidative stress.” Oxidative stress is something that occurs when the system can’t keep up with the stress caused by utilizing oxygen, because the price we pay for using oxygen is that it generates free radicals. These are generated in the normal course of events, and they are “quenched” by antioxidants like we get Treatment Research And NeuroSCience Evaluation of NeuroDevelopmental Disorders in fresh fruits and vegetables; but when the antioxidants can’t keep up or the damage is too great, the free radicals start damaging things. EMF/RFR is genotoxic and damages proteins, with a major mechanism being EMF/RFR-created free radicals which damage cell membranes, DNA, proteins, anything they touch. When free radicals damage DNA they can cause mutations. This is one of the main ways that EMF/RFR is genotoxic – toxic to the genes. When they damage proteins they can cause them to fold up in peculiar ways. We are learning that diseases like Alzheimer’s are related to the accumulation of mis-folded proteins, and the failure of the brain to clear out this biological trash from its tissues and fluids. There are a lot of other things that can create similar damaging effects, such as thousands of “xenobiotic” substances that we call toxicants. Significantly, toxic chemicals (including those that contain naturally occurring toxic elements such as lead and mercury) cause damage through many of the same mechanisms outlined above. I understand that the concept of electromagnetic hypersensitivity is not always well understood in the medical and scientific communities. Indeed, the inter-individual variability is perplexing to those who would expect a more consistent set of features. But given the range of challenges I have listed that EMF/RFR poses to core processes in biological systems, and given the inter-individually variable vulnerability across these symptoms, it is really not surprising that there would be subgroups with different combinations of symptom clusters. It also appears to be the case that the onset and duration of symptoms or even brain response to EMR/RFR can be variable. This again is to be expected given the mediation of these symptoms through a variety of the above-listed pathophysiological processes, many of which differ in scale (ranging from molecular to cellular to tissue and organ) and time course of impact. The different parts of the body also absorb this energy differently, both Treatment Research And NeuroSCience Evaluation of NeuroDevelopmental Disorders because of their biophysical properties and as a function of their state of health or compromise thereof. Full Citations are in the Full Letter Here. Martha Herbert, MD, PhD (2012) Autism Revolution: Breakthrough Strategies for Parents from Autism Canada on Vimeo. 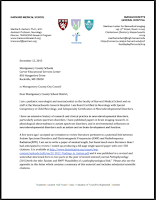 Did you know that several letters have been written to MCPS? See them here. Read Dr. Lennart Hardells Letter . Read Dr. Olle Johanssons Lertter HERE. Read Katie Singers Letter HERE. Read Arthur Firstenbergs Letter HERE.